When Steve Jobs died on 5 October, many commentators wondered whether Apple Inc.—the company he co-founded and led through many years of profit and innovation—could continue to thrive without him. After struggling with cancer, Jobs stepped down from his post as Apple’s chief executive officer (CEO) in August, yet his impact on the company remained profound. After all, Apple’s innovations—from the personal computer to the iPod to the iPhone—changed the way the world communicates and plays. Following Jobs’ death at the age of 56, many argued that Apple’s future was now in doubt. This debate got me thinking about leadership and whether there is one right way to build a great company. Comparing my own experiences at Virgin and Jobs’ at Apple was illuminating, since we both built our companies over the past five decades, but we did so in very different ways. Apple also led a revolution in the music industry when the company introduced the iPod and iTunes in 2001; while the later release of the iPhone and iPad fuelled the creation of a whole industry of application developers. Jobs’ passion for great design was the foundation of what is now one of the world’s most respected brands. When my friends and I were building Virgin, we had to approach things very differently, because our vision was not founded on a product, but on service. Our culture arose from our constant engagement with our customers and each other. This led us to build a company devoted to customer service and staff engagement; to providing great value and maintaining a sense of fun in everything we do—and our company has gone on to open hundreds of businesses in many different industries. Jobs tended to be autocratic, taking a top-down approach, while I have always believed in the art of delegation—one of my primary jobs is finding the best possible people for Virgin and giving them the freedom and encouragement to flourish. When I set up Virgin Records, I even moved out of the office and set up my desk in a houseboat. My thinking was and is that if you are not always available, it forces other people to call the shots, which in turn improves their own leadership skills, builds their confidence, and strengthens your business. So how is it that our very different paths have both resulted in the creation of successful companies? I believe it comes down to our pursuing our passions—we both truly enjoyed and believed in what we were doing. Because you are far more likely to be persistent, inspired and dedicated if you love what you do, and if you eventually make something you are truly proud of, that filters down to your staff and your customers. This was true of Steve Jobs, and for this reason, despite our vastly different styles, he was always the entrepreneur whom I most admired. Looking back over Jobs’ life, he never lost sight of his love for the company he founded, despite being ousted from Apple in 1985. Once outside Apple, he transferred that energy, founding a small company called Pixar which achieved stunning artistic and technological feats and transformed the field of computer animation. When he was asked to return in 1997, he led the flagging company to new heights, and then continued working throughout his illness. For me, leading Virgin has been my great adventure: challenging, exciting and creative; this is something I would do if there was no money in it at all. Sometimes pursuing your vision means that you will have to ignore others’ warnings and even jeers. I have written about my decision to start Virgin Airlines and then Virgin Blue (now Virgin Australia): so many of my decisions have gone against the advice of industry analysts, management gurus and sometimes my closest advisers. In Jobs’ case, the products he and his team envisioned were so different that the stock price usually dropped after one of Apple’s products was first introduced to the public, because shareholders and experts were so certain the company was headed in the wrong direction. This happened again with the release of the iPhone 4S earlier this month, and now sales of this device have broken all previous records at Apple. As you pursue your own entrepreneurial vision, take heart if building your company involves overcoming obstacles and ignoring your critics. Pursue your passion; admit when you encounter something you are not good at, and either delegate it or find a way around it (even Jobs hired great professionals to lead public relations efforts, and he famously formed alliances with Apple’s competitors, International Business Machines Corp., or IBM, and Microsoft Corp.); and when things go wrong, pick yourself up and keep going. This is an adventure that takes courage and conviction. 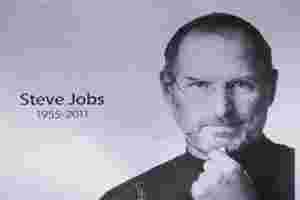 Throughout his life, Jobs encouraged everyone he worked with to “think different". It is advice I have taken to heart. He meant entrepreneurs; he meant you. Richard Branson is the founder of the Virgin Group and companies such as Virgin Atlantic, Virgin America, Virgin Mobile and Virgin Active. He maintains a blog at www.virgin.com/richard-branson/blog.